To ensure your personnel are knowledgeable about not only Sioux products, but all air tools and products, Sioux Tools conducts training seminars that cover all aspects of the tools we sell. 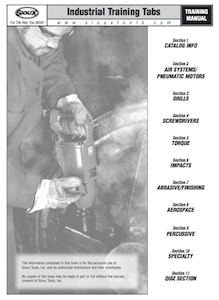 We offer introductory training seminars to help you understand our entire line of tools and their basic operation. Advanced training is tailored to individual needs to help build the skill of an experienced student. In addition, hands-on training is available with particular focus on troubleshooting and repairing. For additional information on Sioux Tools training seminars, please contact your Sioux Tools Sales Representative.